The store is not a Ben & Jerry’s franchise, at least not any more. We don’t really know what it is, yet. But stick with us. 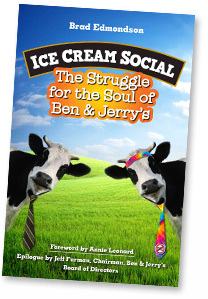 We will find the answer, because the eight-year adventure of Ben & Jerry’s in Russia is a great story. From 1988 to 1996, as the Soviet Union was collapsing and Russia struggled to establish a democracy, Ben & Jerry’s pursued a private diplomatic campaign of peace, love, and ice cream. 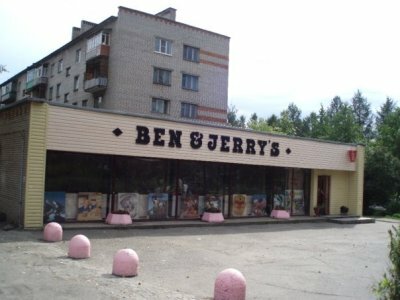 Jeff Furman made 30 trips to Russia and established a joint venture called IceVerks that made ice cream and operated a store in Petrozavodsk, the capital of the Russian state of Karelia. IceVerks also sold a franchise to an entrepreneur in Kondopoga. Twenty years ago, Kondopoga was a drab place dominated by a huge, dirty Soviet paper mill. When Jeff went there for the grand opening of the store in 1993, Russia was skating at the edge of anarchy and free-market capitalism was at its freest. Jeff remembers that the IceVerks crew ran their business on a heady mix of excitement, inspiration, and fear. At the grand opening, Jeff asked the businessman what he wanted to do next. The newly unleashed entrepreneur threw his arms wide and boomed, “I want pizza!” The bright colors and playful atmosphere of Ben & Jerry’s were seeping into the drab town, waking everybody up from a 75-year Communist nap.